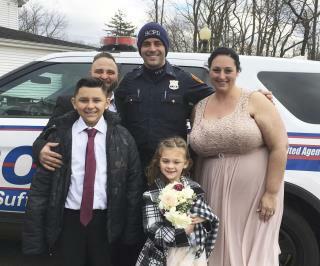 (Newser) – A Long Island couple, a car crash, and the world's most earnest cop—what more do you need on a wedding day? Joseph DeMichele and fiancée Feliece Terwilliger were driving to say "I do" Saturday in the village of Lake Grove when they crashed into a car U-turning in front of them, ABC News reports. No one was hurt, including their two kids, ages 5 and 10, but the accident was at 1:15pm. The wedding was slated for 15 minutes later. "It really was one of those things that you were anticipating for so long that you were just wanting so badly for the chance to get married," says DeMichele. "All I wanted to do was marry my best friend." And the crash scene didn't bode well: cops, firefighters, two hysterical children. What hope was there? They've got children ages five & ten and NOW they're worried about being late to their wedding? She has great bumper knicker knickerbockers.